(Orlando, Fla. — June 1, 2018) The International Parking Institute (IPI) recognized two parking operations with its 2018 Parking Organization of the Year Award: Duke University Parking and Transportation Services, and MAWAQiF Parking Division, Integrated Transport Centre (ITC), Department of Transport, Abu Dhabi, United Arab Emirates (UAE). Duke Parking and Transportation Services in Durham, N.C., is a well-oiled machine that embraces the future, using technology, business smarts, and innovation to offer the best parking experience to its customers. Its 116 employees manage almost 27,000 parking spaces and an extensive transit system with 33 buses. Duke boasts one of the largest Parking Access and Revenue Control System (PARCS) installations in North America and its new license plate recognition (LPR) system has helped ensure safety and improve enforcement. This organization has embraced alternative transportation with initiatives that include Unpark Yourself, which encourages faculty, staff, and students to explore alternative commuting options; two bike-share programs; low-cost or free transit for commuters and students; and 20 electric-vehicle charging stations. Duke also has completed two major parking garage renovation and built a new medical center permit and valet lot. MAWAQiF, Abu Dhabi Parking Division (ADPD) of the Department of Transport-Abu Dhabi, is one of the world’s largest parking operations under one authority. Managing and regulating more than 112,000 on- and off-street parking bays with more then 410 parking inspectors and a pool of office based-employees, it has addressed a severe parking shortage in the central business district. Automated kiosks offer 24/7 access to parking, through more than 800 kiosks that handle 18 percent of all payments and transactions across the UAE. ITC also introduced Darb, its smartphone app, offers real-time information on parking availability for more than 100,000 users, along with a pay-by-SMS option. ADPD’s two modular, temporary, 286-space parking structures meet demand at two prime locations. ADPD also promotes carpooling, park-and-ride, shuttles, biking, and electric vehicle use; all new and refurbished garages are fitted with chargers. Television and social media messages promote safety through legal parking and smart parking solutions, earning ADPD a 94 percent customer-service rating and 98 percent compliance rates for three years. 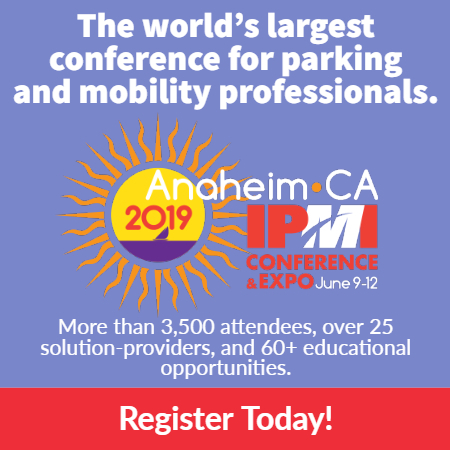 The annual award, announced at IPI’s 2018 Conference & Expo in Orlando, Fla. June 3-6, recognizes parking organizations that exceed expectations and meet high industry standards.